8", 2006, Fourth and last Great Masterpiece Mohair Muffy. She pirouettes across Swan Lake in her white satin costume trimmed with opalescent sequins. A fluffy tutu and delicate organza overlay with silvery edges evokes swan wings. 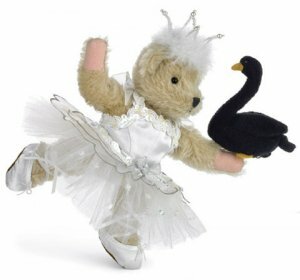 Like a real ballerina, she wears satin toe shoes, a beaded downy crown and in true Muffy style, nestles a black swan friend under her arm. Muffy comes in a elaborate collector's box with certificate.